Now that there are affordable health insurances you would think you would be able to get in and out of the emergency room in less than a day. The true is health insurance is not that affordable to many in African American Communities. I must agree It is good that your employer must provide insurance for you if you have a job, it is good that if you are laid off you don’t lose your insurance if you still can afford to pay the premium, it is good that your kids can stay on your insurance still they are 25 if you can afford a family policy and it is good you can’t be turn down for prior illness if yon can afford to pay the high premium. However In my humble opinion unless insurance premium is base on a percentage of income just like low income housing, for the poor affordable insurance is the Medicaid card. An expansion of the Medicaid program will substantially reduce the emergency room usage and improve the over all health of the African American Communities. How do you measure violence prevention success? After a careful reading of an article and all comments on the Chester city Blog dated June 2, 2012 pertaining* to a Violence Prevention event in Chester Park. The blogger had been motivated to write the posting by an Email sent to the him by one who had nothing but praise for the event. The blogger had a different view of the event and asked the question. How do you measure violence prevention success? While I agree with his argument if it is that there are thugs, knuckleheads and hardened criminals still on the streets of Chester that should be locked up, however I can’t disagree with him more if what he is saying is that because there was a murder on the streets of Chester the very next day, the violence prevention program was a failure, waste of time or unsuccessful. His reference and tone pertaining to the atmosphere at the violence prevention program is somewhat troubling. It seems to be biased and politically motivated: It should be clear to all that the park is the best facility in Chester to inform and motivate masses of people; and the best way to motivate people is with a study and progressive programs of love, understanding and respect amongst neighbors and neighborhoods. If he calls that a party so what! As much as I respect the work he is doing for Chester I do believe he should have taken a longer bike ride before he posted his comment. I understand that the DA, The FBI, The Chester Mission and Ted *(freedom fighter) Sutton were a part of this successful program and it should be recorded and remembered as such. I am fully aware of the good work that the Chester Mission is doing for our young people on the streets of Chester and have nothing but respect for them: What encourages me most is the effort by the young men and ladies of The Mission and the Brothers of Concern to change the perception of our young boys and girls in a way that they won’t become a party to the violence and senseless murder that is happening on our streets today. Please Note these programs are preventing violence not only for today but forever. In an effort to get government grants, The County has successfully painted a negative image of the City of Chester, Pennsylvania. As of the 2000 census, there were 36,854 people, 12,814 households, and 8,124 families residing in the city. In the 1960s, Chester began losing its mainstay shipyard and automobile manufacturing jobs, and this has caused the population to decline by nearly half in 50 years. Poverty and crime rose as the population decreased. In 1995, the state designated Chester as a financially distressed municipality. Soon thereafter, the city’s schools ranked last among the state’s 501 districts, and as of the 2010 census, there were only 33,972 people living in the city. Over the past 50 years, Chester, PA has felt the effects of great social movement. It has seen the unionization of the work force, the world opening to cheaper labor, and the exodus of the middle class to the outskirts of the city, forming suburban communities. These things happened all at the same time, at the expense of Chester. This along with with the relocation of the county court house from Chester to Media caused the city to become even less important to the county. At the same time, Delaware County’s industry overall has also been shifting from manufacturing to service, however the county government taken action to attract more service-based industry to the county. New office buildings were built county-wide, attracting new businesses. Real estate investors and developers soon followed by building townhouses and apartment buildings in the suburbs of Chester to accommodate the influx of people following these new businesses. These changes altered the way of life for the residents of Chester, and it created communities of discontented people who have been left behind. The city officials’ failures to react to these changes consign Chester’s future growth to the wishes of the county. Unfortunately, the county’s plan was to attract new service industry to the open lands in Delaware County, not to the City of Chester. The county created and expanded social supports in an attempt to reign in the overall gloominess created in Chester. As a result, Chester now has approximately 60% of the population on some kind of public assistance. At the same time, taxes are the highest in the county, and the housing stock is old and deteriorated. Chester has now moved from a manufacturing-based economy to one based on social relief and grants. The downward trend of the city begun, but the county found a new use for Chester. It will be home to Delaware County’s poorest and most destitute citizens. With the aid of federal and state grants, the county is establishing more programs for the poor, uneducated, and unemployed people of the county, these programs offer high-salaries to their directors. These high-paying appointments enjoy the power that comes from controlling the poor. If Chester, PA is to be a successful city again, it can’t have the majority of its people live at the point of bare subsistence. To become successful, the City of Chester must rebuild its good reputation, and this should start with a shift in perspective. The government must spend the taxpayers’ money prudently, making decisions that deal with the development, management, and rehabilitation of the city. Chester’s social agencies must stop painting a picture of a city that is home to crime, poverty, and ignorance in order to qualify for further social programs. The city’s housing program needs to become a success and a positive influence by having other goals beyond simply housing the poor. Housing Grants should be given to small investors for the renovation of existing homes in Chester. More time and effort must be put into changing the future of Chester, starting with the people.If changes don’t happen, and Delaware County continues to use the poverty-stricken people of Chester as their cash cows, the people of Chester should look elsewhere for the future of Chester, and for the future of our children. Chester is a 3rd class city Do we really need to have the county as our middleman? I just readied the editorial by Rose Quinn of the Delco Daily Times regarding the Trayvon Martin Rally’ in Chester. Can any body tell me what is a White Hispanic: is that the same as a white African American? With Gingrich hate and bigotry will again become a prescription for need and hunger for some American. The New Mayor Jobs Appointments. After a quick and fair review of the facts pretending to the new mayor and his jobs appointments. I must first concur it is not the best thing to have people release from their jobs base on their political party connection. However I must also recognize the facts persist in every election when the controlling party changes from Republican to Democratic or from Democratic to Republican in the city Chester or wherever all-political appointments are up for change by the newly elected party. If you think back I assure you some of the people who’s are now being release from their jobs got them under the same set of circumstance a newly elected republican mayor replacing democratic appointment with people connected to the Republican Party. But don’t we expect a new leader to make appointments that he feel will help to consolidate his control of the city government in his attempt to put his vision of how to better serve the people in operation. Think about It. Did you Know A $50 million revitalization project along Providence Avenue in Chester, has generated 32 new jobs thus far — 16 of which went to Chester residents — and more jobs are expected as business tenants continue to move into University Crossings. The project is expected to produce an economic impact of $1 million dollars each year. African-Americans’ buying power is expected to reach $1.1 trillion by 2015, according to The State of the African-American Consumer from Nielsen and the National Newspaper Publishers Association (NNPA), a federation of more than 200 Black community newspapers across the U.S. This growing economic potential presents an opportunity for Fortune 500 companies to examine and further understand this important, flourishing market segment. Likewise, when consumers are more aware of their buying power, it can help them make informed decisions about the companies they choose to support.“Too often, companies don’t realize the inherent differences of our community, are not aware of the market size impact and have not optimized efforts to develop messages beyond those that coincide with Black History Month,” said Cloves Campbell, chairman, NNPA. 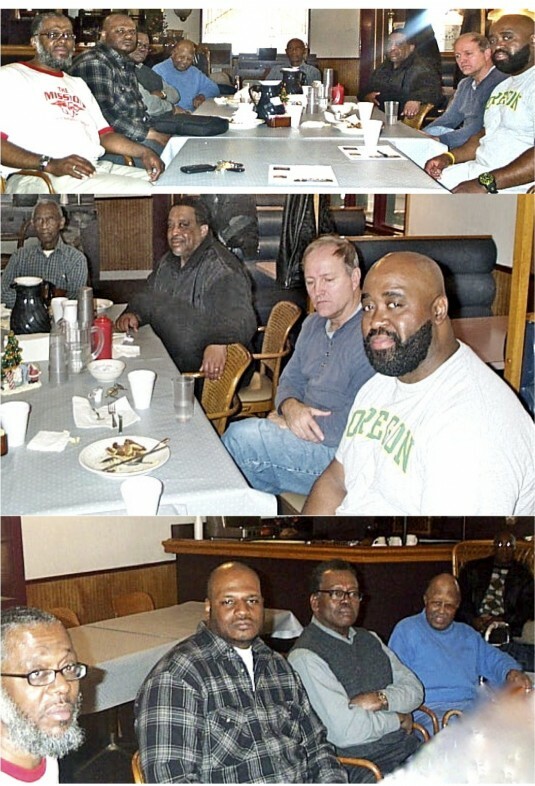 Kudos to all of the Brothers that attend the Men’s Breakfast Forum on December 3, 2011:our discussion leader was Attorney John W. Nails of the Law Office located at 400 Welsh St. Chester Pa 19013. The fellowship is indebted to John for his freely giving of his time and knowledge at the December 3rd 2011 breakfast forum. Ever man in Chester good have benefit from his insight of the American legal system. Darren Laws of The Mission comment on his experience with the young boys and girls and how they are affected by the legal system. We were happy to have with us for the first time Deacon Rocks and we thank him for his wisdom and observation.